Back Issue of the Week: Turok Dinosaur Hunter #1 (July 1993). The early 1990s were a period of excess in terms of the cover enhancements publishers would attach to their various titles in order to attract attention in a crowded marketplace. 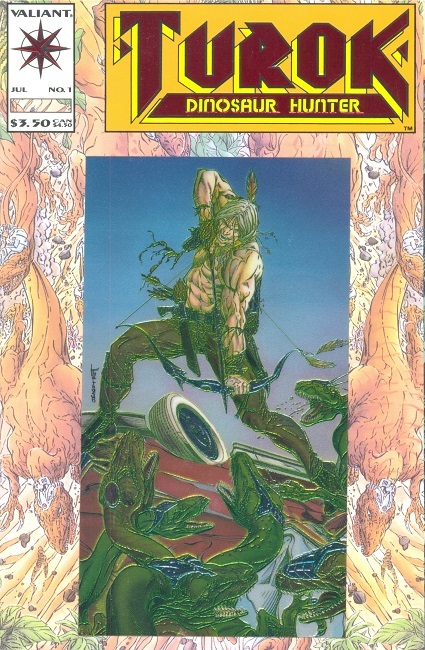 Die-cut foil fold-out covers that glowed in the dark overwhelmed the racks, and one of the most famous (or perhaps infamous of these was the first issue of Turok Dinosaur Hunter #1 (July 1993). This was a relaunch/revamping of a title previously published by Dell Comics/Gold Key from the mid-1950s until the early 1980s. This was a formula its publisher, Valiant Comics, had followed with previous titles, relaunching other Dell/GK properties like Solar Man of the Atom and Magnus Robot Fighter (alongside new titles like Harbinger ). Many of Valiant’s back issues had become, in common monthly price guide magazine parlance of the time, “hot.” Early issues of their other titles were in high demand, and commanding hefty prices, which encouraged retailers at the time to place large orders on this new comic. Well, you can probably guess what happened. Part of the reason those early Valiants were in such high demand was scarcity…orders were relatively low on the earlier issues of their previous titles. Demand far exceeded supply for those comics, but for Turok Dinosaur Hunter #1, where every retailer had stacks and stacks of them available…there was no shortage of these at all. Also happening at this time, and perhaps discouraging sales on this issue, the industry-wide collapse of the comics market was beginning to happen, as overproduction and an overwhelming emphasis on “collectability” and “investment” (as opposed to simply just reading ’em!) began to take its toll. Whether Turok Dinosaur Hunter #1 was a symptom or a cause of said collapse can be debated. It’s not that the comic didn’t sell to customers, but it just didn’t sell to the expectations of its initial orders, leaving behind excess stock and the perception that this comic was a sales failure. Twenty-plus years on, however, and the gimmick-covered comics that once flooded the shelves and were the symbol of the market troubles the industry faced in the 1990s have regained a little of their luster. Now consigned to back issue bins, they’re once again odd and attractive novelties to be discovered, not a wall full of shiny attention-grabbers to be endured. Even poor ol’ Turok Dinosaur Hunter #1, with its bit of overkill in the chromium card glued to an embossed cover, topped with a red foil logo, may be gaining a new appreciation today. It’s a weirdly attractive comic, and a fun read (like many of those old Valiants were), and outside the context of tumultuous market forces, deserves a second look. This entry was posted in Back Issue of the Week on September 15, 2016 by Mike.